Albert Einstein College of Medicine’s 48th annual commencement will take place at Lincoln Center’s Avery Fisher Hall on Wednesday, May 31st, at 2:00 p.m. Dr. Irwin Merkatz, professor and chair of obstetrics & gynecology and women’s health at Einstein, will deliver the commencement address. He is celebrating his 25th anniversary this year at the helm of Einstein’s ob/gyn department. Sen. Hillary Rodham Clinton will deliver the principal convocation address and receive an honorary degree at Yeshiva University’s 81st Annual Hanukkah Dinner and Convocation on Sunday, Dec. 11, at The Waldorf=Astoria. 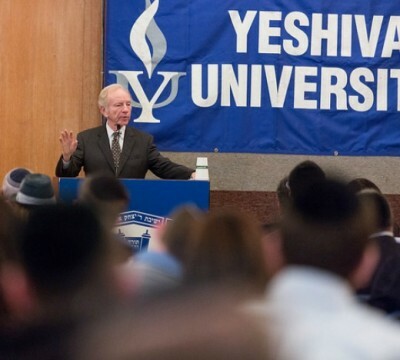 Seventy two years ago, Dr. Bernard Revel, Yeshiva’s first president, stood before the first graduating class of Yeshiva College, and sent them forth in a complex world, with timely and timeless words: He said “You, our first graduates, are going forth into a world that is today governed by conflict, fear, and distrust. Modern civilization is at a spiritual crossroads. We stand upon the brink of an epoch. The Honorable Sandra Day O’Connor, Associate Justice of the Supreme Court of the United States, will be the featured speaker at the 26th commencement of the Benjamin N. Cardozo School of Law of Yeshiva University at 3:00pm on Tuesday, June 1, 2004. At the ceremony, which will be held at Avery Fisher Hall of Lincoln Center for the Performing Arts, 333 men and women will receive J.D. degrees and 45 will receive LL.M. degrees. Hundreds of high school students from across North America will debate the world’s fate at the 14th Annual Yeshiva University National Model United Nations (YUNMUN) conference, Feb. 8-10, at Kutsher’s Country Club in Monticello, NY. President Richard M. Joel kicked off the 13th annual Orthodox Union Torah Convention in Los Angeles on Thursday, Dec. 11, when he delivered the keynote address, “The State of the Jewish People,” at a dinner held at Congregation Shaarei Tefila.